The 1 oz gold Krugerrand is the most minted coin in history. When all the sizes of Krugerrand gold coins available are added together there have been minted more than any other type of coin, making them one of the most recognized by investors and others around the globe. These coins have a distinctive look and a rich interesting history behind them. A 1 oz gold Krugerrand was the first bullion in the world that acquired the status of legal tender currency in South Africa. 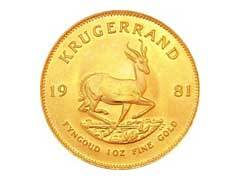 Krugerrands are legal tender, and they have a known weight and quantity which makes them very desired and sought after. These coins have been minted since 1967, and can be a fantastic investment with relatively low premium costs compared to other similar bullion products. Krugerrand bullion coins that come in various sizes ranging from 1/10 of an oz all the way up to a full oz, are not considered the most beautiful coins among the rest of the bullion products. Rather Krugerrands are sought after because of their value and all the benefits that these coins can give you. They may appear rough or unpolished, but they are still just as valuable in spite of this appearance. While some one ounce bullion coins, like gold Maple Leaf coins, are twenty four karat this is not true of Krugerrands. A 1 oz gold Krugerrand is twenty two karat composition or made up of 91.67% pure gold and copper alloy giving it a coppery tint. Most other bullion coins have copper and silver alloy, however, copper in its composition makes them more scratch resistant. The 1 oz gold Krugerrand still contains one troy ounce of the yellow precious metal, just like all of the other 1oz bullion coins you can find. The twenty two karat composition does not alter the weight of the precious metal content used, just the finished product. If one of these coins is melted down and the two percent copper is extracted, what is left is one troy ounce of pure yellow precious metal. Most precious metals experts agree that Krugerrands are some of the best bullion coins to acquire due to their high quality, demand and wide accessibility. In addition, they also come at surprisingly low dealer premium costs allowing you to enter the precious metals investment market at an affordable cost.